I HAVE THE POWER (PELLET)! The first coin-op video game I remember playing was Pac-Man. It was in the local supermarket, right by the entrance. Since this was the early 1980’s, my mom had no qualms about leaving me alone with the game and a few quarters, especially if it meant she could do the grocery shopping without me asking for an obscene amount of Pepperidge Farm Goldfish or Peanut Butter Cap’n Crunch cereal. Now I’m a grown man and I can’t stop playing the brand new Pac-Man Championship Edition DX. Pac-Man seems so simple a game now, but it was every bit the cultural phenomenon it is talked up to be. Witness the endless array of sequels, merchandising tie-ins, and repackaging Pac-Man has gone through in the last 30 years. For a lesser game, Namco would probably be accused of flogging a dead horse, but they have managed to keep the game fresh at each turn, whether it’s with new mazes and characters (Ms. Pac-Man, or the vastly underrated Jr. Pac-Man), improved graphics (Pac-Mania, Pac-Man Arrangement), or gameplay tweaks (Arrangement, Pac-Man Vs.). 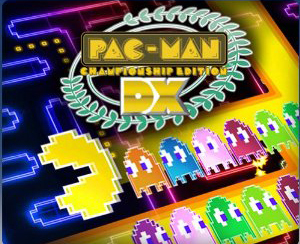 Pac-Man Championship Edition DX takes all of that and creates a game that is equal parts a reimagining of the game and homage to its roots. 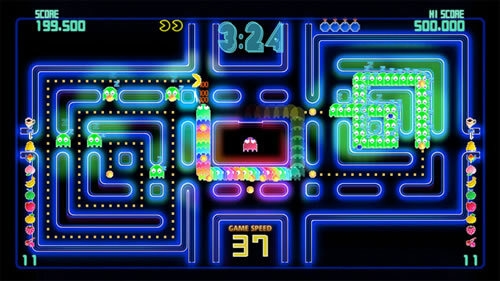 The gameplay model was already established with last year’s Pac-Man Championship Edition: the maze is divided into two halves, eating all the dots on one side causes a fruit to spawn on the other side, and eating that fruit refreshes the other side’s screen with a new maze and more dots. Unlike last year’s, the game play is geared far more towards following set patterns. Most of the maps offer a very clear path to follow, one that leads you past sleeping monsters who will wake up and follow you as you pass. Clear the board a few times and you could have up to 30 monsters chasing you all over the maze. The patterns and paths inevitably end with a power pellet and a veritable scoring bonanza of edible monsters behind you, and occasionally in front of you as well. And, yes, there are multiple maps now; to that end, the parallels between the original Pac-Man and the more expansive Ms. Pac-Man are there. Combine the patterns with the ever-increasing speed of the game, and you have a game that inspires repeat plays. I’ve had plenty of experiences where the fast pace of time trial mode has caused me to miss a turn and I knew for damned sure that I could’ve shaved at least half a second off my time if I made it, which led me to try again… and the next thing I knew, I’d been playing the same board for over an hour. 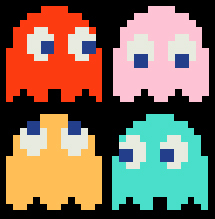 Similar experiences await in Ghost Chain mode, whose object is to eat as many ghosts (and power pellets) in one go as possible, or the score based modes that give you 5 or 10 minutes to rack up as high a score as possible. Pac-Man Championship Edition DX also adds two new gameplay tweaks that improve on the original, non-DX version. The first is the addition of bombs, which act as a panic button when things get hairy. Stuck in a tight spot with the ghosts? Bomb them back to the center of the board. But, of course, it will cost you – your score multiplier gets halved and the game slows down, thus limiting how quickly you accumulate points in the short term. In addition, if you do get stuck in a tight spot with the ghosts, the gameplay slows down to allow you to get out of the jam. But while the game play slows down, the game clock continues at the same pace, again costing you the opportunity to earn points. In terms of homage to the game’s past, there are bits from almost every game in the Pac-Man pantheon. In addition to the aforementioned Pac-Man/Ms. Pac-Man feature jump, the available graphics sets take from multiple games, so the experience shifts from the blue maze and pixelated sprites of the original to the pseudo-3D look and more detailed backgrounds of 1987’s Pac-Mania. The game also includes developer interviews via the Namco Generations option in the menu, which are interesting but non-essential to the game experience. If you purchased Pac-Man Championship Edition last year, Pac-Man Championship Edition DX is a no-brainer to purchase again, even if it includes last year’s mazes. 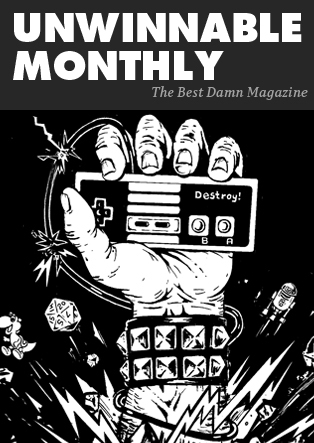 If you haven’t, it’s like getting two games for the price of one with the inclusion of last year’s mazes. Trust me – whatever you need to do to rationalize the purchase, do it. You’ll thank me later when you have a sink full of dirty dishes, a week’s growth of unwanted body hair, and an angry spouse or significant other tapping their feet impatiently because you’re having too much fun with the addiction. Pac-Man Championship Edition DX is available from the Xbox Live Marketplace and PlayStation Network for 800 Microsoft Points or $9.99. Review based on the Xbox 360 version, but the PS3 version can’t be all that different.